madelinetosh TOSH Chunky | 100% Merino Wool Yarn - Machine Washable! Tosh Chunky is a 100% superwash merino it that we are introducing in Tosh's Fall 2015 Colorways. Working up at a larger then worsted, slight lighter than Aran so, Chunky is perfect for hats, accessories, and sweaters. It is a three ply, with lots of bloom, so the resulting project will be full of sqoosh and softness - it's similar to vintage, which is a 4 ply worsted, with tighter ply, so the effect is very different. Each squishy soft skein is hand-dyed in small dye lots and machine washable. This yarn is so stunning - it is almost cashmere soft, with lots of loft and texture. You can see it in spicwood at left. WOW! 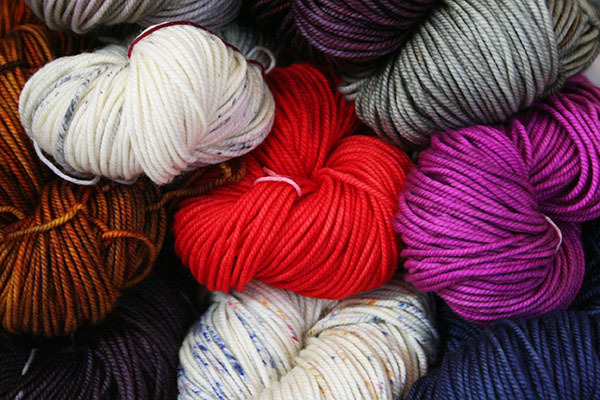 Volume Discounts will apply to this yarn at checkout - sign up for the Elist Xtra 5% Off! Need a specially dyed perfectly matched set of skeins? Preorder your tosh chunky here - we'll sneak it into our next order. Preorders can take up to 13 weeks!